The GM centrifugal pump is specially designed for food, chemical, pharmaceutical and other industries where acid resistant steel is required. The GM is a small scale centrifugal pump for sanitary applications. Centrifugal pump FM-OS is designed for use in food, pharmaceutical, chemical and other industries where acid-resistant steel is required. The FM is a small scale centrifugal pump for sanitary applications. Our premium range of centrifugal pumps, the LKH centrifugal pumps are distinguished by high efficiency and low NPSHr. The LKH can be configured with multiple options and covers a wide range of flow rates and pressures. The LKH Evap is a low NPSHr, high efficiency centrifugal pump is optimised for evaporation applications. The LKH Evap also features the ClearFlow impeller option for applications where the build up of solids may be an issue. Designed to meet the hygienic requirements of the dairy, food and beverage and personal care industries, LKH-Multistage centrifugal pumps increase process productivity while providing high efficiency and gentle product handling. LKHI centrifugal pumps for inlet pressures up to 16 bar increase process productivity while providing high efficiency and gentle product handling. They are desgined to meet the hygienic requirements of the dairy, food and beverage and personal care industries. SolidC is a standardized centrifugal pump for standard applications. SolidC UltraPure is a cost effective centrifugal pump designed to meet stringent biotech and pharmaceutical standards. 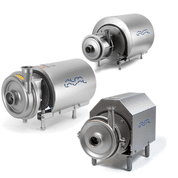 All Alfa Laval Ultrapure equipment are delivered with the standard Alfa Laval Q-doc documentation package. LKH UltraPure centrifugal pumps deliver maximum uptime and high efficiency, and offer the benefits of easy cleanability and thorough documentation. They are designed to meet the specific demands of the biotech and pharmaceutical industries. All Alfa Laval Ultrapure equipment are delivered with the standard Alfa Laval Q-doc documentation package. The AC/AC+ features a simplistic and sanitary design. Made from 316 stainless steel the AC/AC+ is corrosion resistant and is 3A Certified for sanitary use. The AC pump is an ideal choice of pump for Wine Turnover duties.